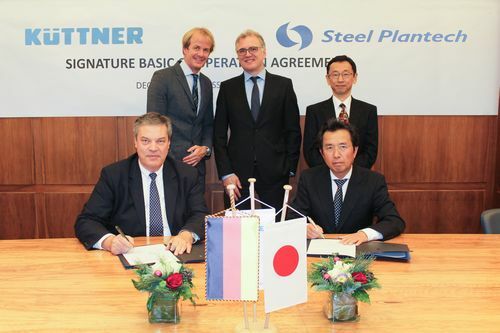 JP Steel Plantech Co. (Head Quarter: Yokohama, President: Mr. Kazuya Yamagishi), agreed to strengthen the mutual broad cooperation relating to iron & steel technology with Küttner GmbH & Co. KG, German Engineering Company, and has signed a Basic Cooperation Agreement. In recent years, the world steel market has been facing a period of low growth due to the Chinese economic slowdown and the political instability of Eastern Europe as well as the Middle East, and consequently no major investments have been made. Under these circumstances, M&A or alliances are increasingly active worldwide in the iron and steel engineering industries, including in Europe and Japan. In line with this global trend, JP Steel Plantech Co. has decided to enter into comprehensive cooperation agreement with Küttner GmbH & Co. KG to strengthen his overseas activities in both directions. Küttner is a world leading technology supplier to the mining industry and steel industry, especially in upstream activities, has successful track record in Europe, and now intends to extend this activities in Asia. JP Steel Plantech Co. has a wide product line both upstream to downstream, and has accumulated this record mainly in the Asian region, and now intends to complement the technology of iron making, and to strengthen its capabilities to Europe with Küttner. As a result of this an entire range of technologies for iron and steelmaking will be available for steel producers from their known and respected supplier. This cooperation will include market development, technology development, mutual supply of equipment and after sales service support. JP Steel Plantech Co. intends that the cooperation with Küttner GmbH & Co. KG will not only create mutual synergies, but will also be the first step to construct a premium supplier network for providing excellent technology to clients worldwide in the near future.